I use the term “making” here a little liberally as I only actually made from scratch one part of my costume for the Enchanted 10k – the rest of more of how I put the costume together from various pieces I had or bought. 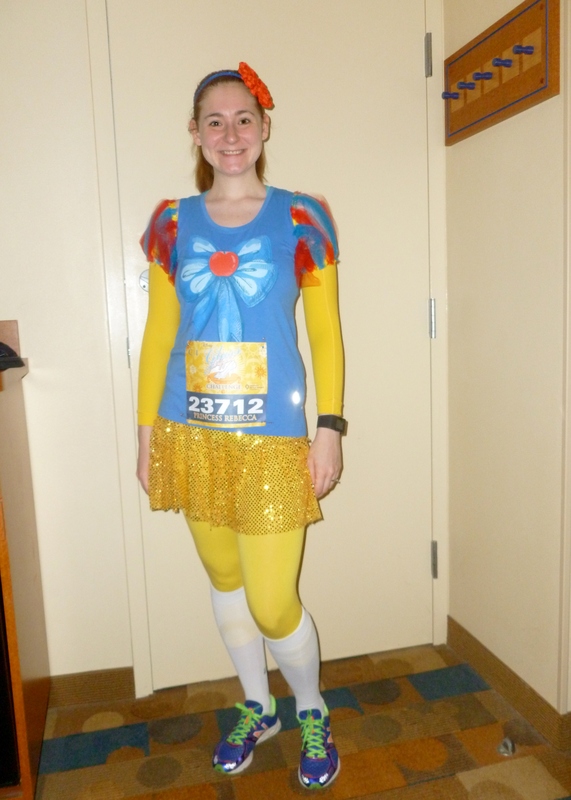 But I was really happy with how it turned out, so I wanted to share what I did to make my Snow White running costume! The shirt I used is from one of my favorite running shirt companies, Raw Threads. They make shirts inspired by tons of Disney characters. 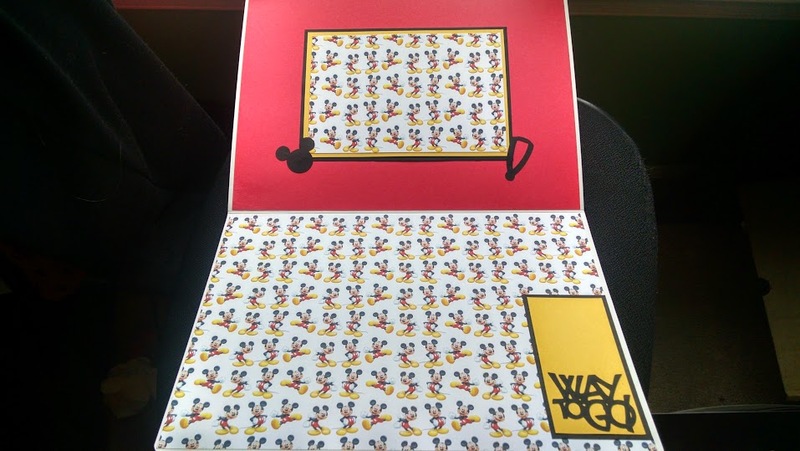 I actually got this one as part of a mystery pack that I had ordered, which is when you can get three shirts at a discounted bundle price, but you don’t know which ones you’ll get. Receiving this one is actually what inspired me to do a Snow White costume! 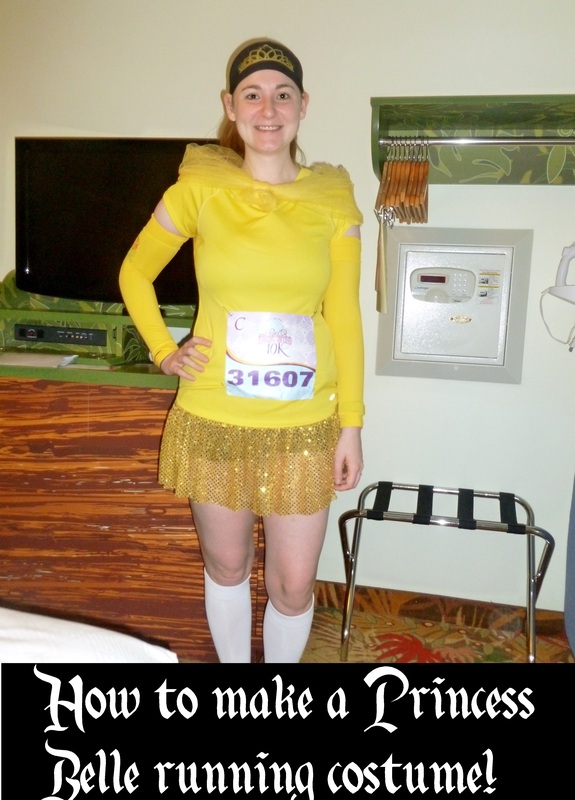 Even if you don’t want to do something like this, any blue running shirt will work for the costume. 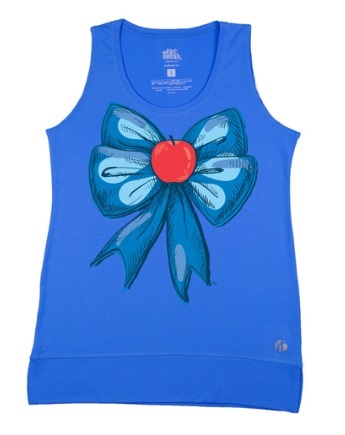 I just like the bow with the apple because it adds a bit extra “Snow White” to it. 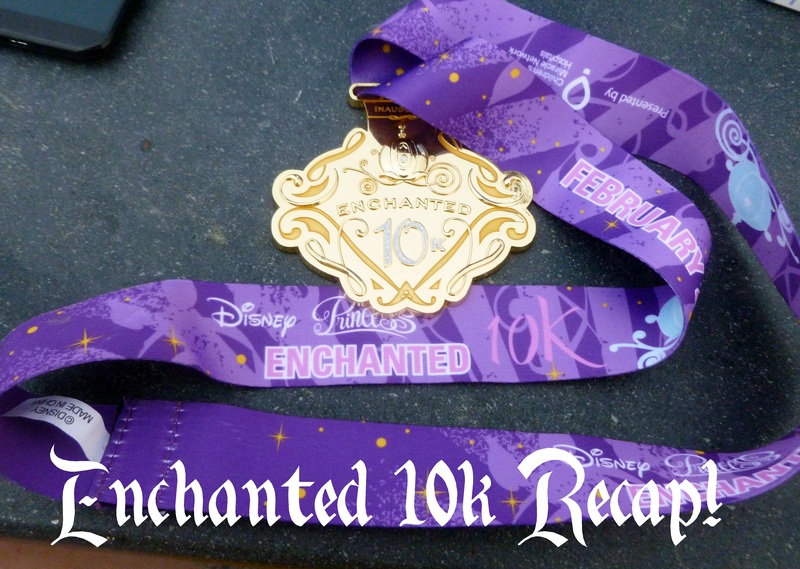 February 21st the second Enchanted 10k, and also my second time running it! 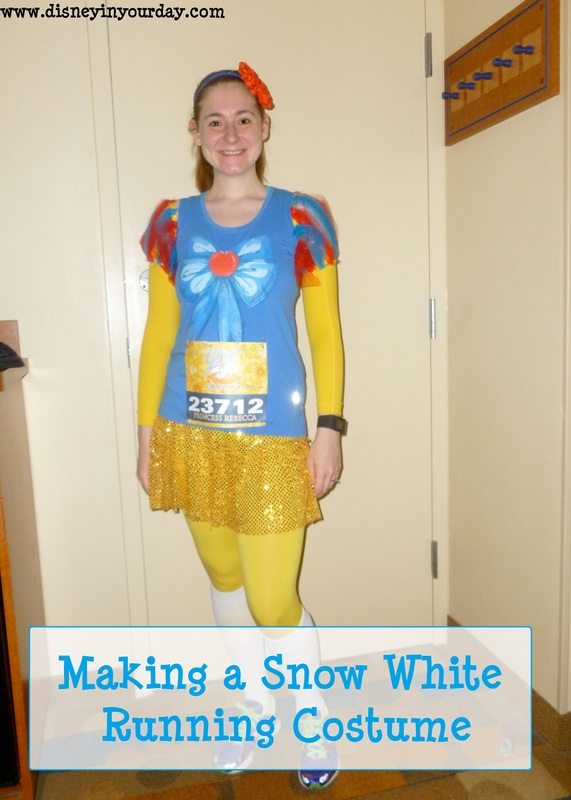 We were up bright and early, and I got into my Snow White running costume that because of the cold temperatures now had leggings and running sleeves to it. We got on the bus around 3:30, so that we could stand around in the cold for two hours. It was only in the low forties that morning! I had brought a throwaway sweatshirt but I was still freezing the entire time until I started running. There were 5 corrals, A-E, and I was in C. Last year the corrals started about 10 minutes apart, but this time it seemed to be even longer, about 12 minutes. I started at 5:55 am. I planned to take it easy since I was running the half marathon the next day. ToT 10 miler training: 13 weeks to go! A little more than 3 months to go until the Tower of Terror 10 miler! 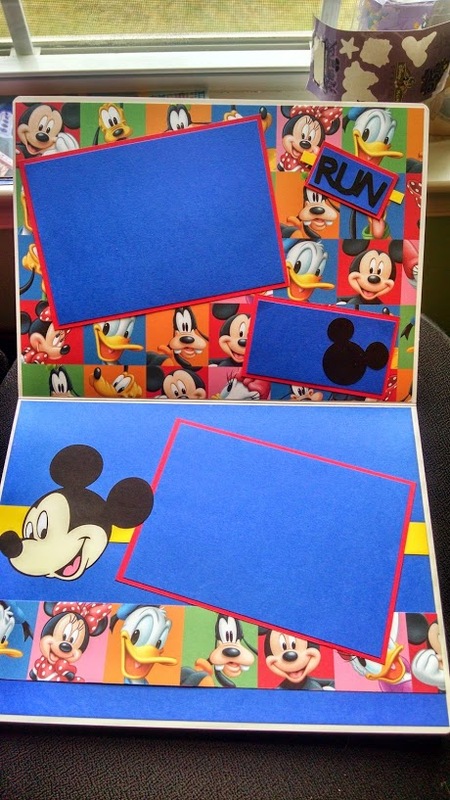 But that aside, it’s actually time to start thinking about the next Disney race: because registration for Princess Half Marathon weekend opened this week for AP/DVC members, and will be on this Tuesday for everyone else. 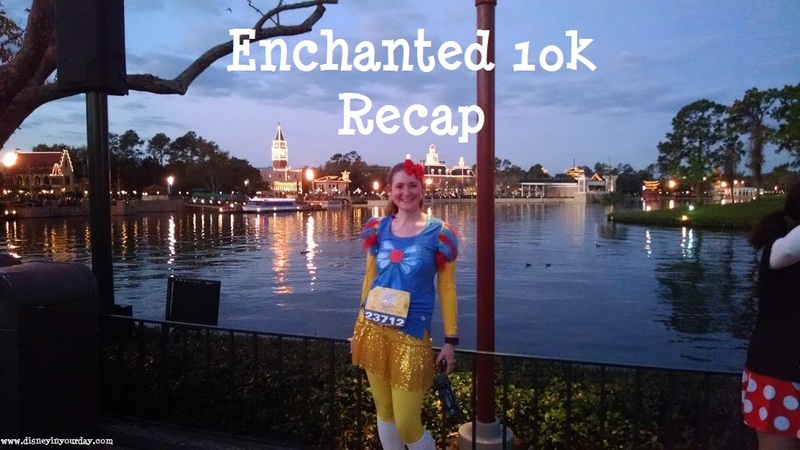 As you might know, I did the Enchanted 10k last year. 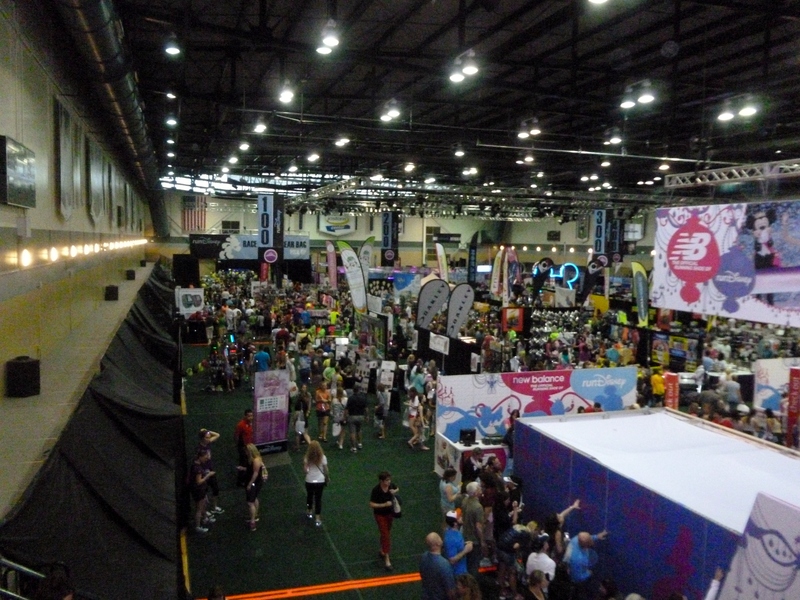 I was thinking I would do the Half Marathon this time around – it makes sense. I could do 10 miles in October, and then I should be fine working up to 13.1 by February, right? I didn’t want to do the Glass Slipper Challenge yet because I haven’t done a half yet and I worried that it would be too much. And then my husband chimed in. He said, “you did the very first Enchanted 10k. Wouldn’t it be cool if you did it every year? You should do the Glass Slipper Challenge.” Yeah, that’s a good point… but it also costs more money. And he says, “I just got a bonus at work and I would love it if you used some of my money to sign up for the Glass Slipper.” Isn’t he absolutely the best? I think he might have more faith in me than I have in myself sometimes. But he really believes I can do GSC so I’m going for it! I am now registered for it. Crazy stuff! But back to the race at hand. This was week 6, with the longest distance I’d had so far in this training. Since I’ve done a 10k before, the furthest I’ve ever really run is about 6.2 miles.